Want to Crash a Wedding? Practice your Bhangra dance moves before going to “Bollywood Wedding” at New York’s Nuyorican Poets Café. This production by Zeshan Bhatti provides the audiences a whirlwind view of all the things that can go wrong (or right in some cases) at an Indian wedding. 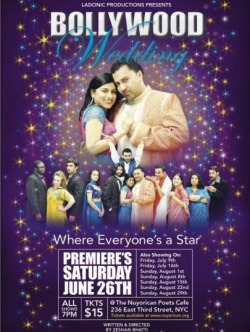 Many Bollywood films draw a single story line from the insanity that can very occasionally occur between two different families at actual weddings, though rarely as public a fiasco as “Bollywood Wedding” portrays. The basic premise is an upper-class Indian girl, Nisha, from an ultra-westernized Indian family, gets married to a middle-class Indian boy, Raj (Zeshan Bhatti), whose family stays deeply rooted in their Punjabi roots and Indian customs. Raj's life-long dream of becoming a Bollywood star is mocked by his future in-laws as they stew and heralded by his own family. Chaos ensues as scandals and revelations are introduced including affairs, secret relationships and the return of past lovers. The production is an interactive affair with the players staying in character and talking with audience members as if they are wedding guests. The cattiness starts immediately as the elder bitter auntie comes out and starts spewing transparently veiled criticisms while mingling with the guests prior to the wedding. It is all quite authentic in many cases and the humor and entertainment is provided by jamming every possible whacky scenario into a single play. While quite enjoyable and a fun experience, the plays inserting of so much material can leave some audience members lost or almost exhausted at the end. The interactive nature was well done, well-written and most of the acting was spot-on. Each person played their role very well just like some of us may have witnessed at actual weddings. Many of the plotlines are hardly exclusive to Indian weddings, so it is a fun play to take non-Indians, who will certainly enjoy it as well (though may ask a question here and there). So bring a date or your friends and sit back and enjoy the hilarious chaos!